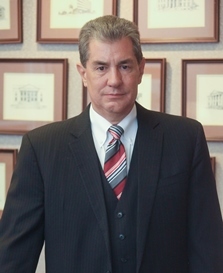 Eric Taylor has lived in Nevada since 1979, and has developed a diverse civil litigation practice. Eric was born in Honolulu, Hawaii and raised in Salt Lake City, Utah. He attended the University of Utah where he received a Bachelor of Arts, followed by his Juris Doctorate. Following graduation from law school, Eric accepted a position at Alverson Taylor & Sanders (then known as Reid and Alverson) and became a partner in 1985. Eric’s practice has centered in civil litigation. He has represented plaintiffs and defendants in commercial litigation, products liability, administrative law, negligent security, premises liability, construction defect, professional liability, and personal injury cases. During the Nevada State Bar’s initial examination into the feasibility of a mandatory non-binding arbitration process in the early 1990’s, Eric served as an Arbitrator in over 250 cases. Eric is also the hiring partner for the firm and for over 25 years has been in charge of all attorney hiring. He is a member of NALP, The Association for Legal Career Professionals. Eric is licensed to practice law in Nevada, Utah, and Arizona, as well as the U.S. Court of Appeals, Ninth Circuit. He has an “AV Preeminent” rating with Martindale Hubbell. He is an active member of the Clark County Bar Association, State Bar of Nevada, Utah State Bar, State Bar of Arizona, and the Nevada Justice Association, and has been listed in the area of General Litigation by Mountain States Super Lawyers.